To illustrate the exercise, Goldberg drew a circle with three slices on a paper napkin. One slice stood for what they were most passionate about, another represented what they could be best in class at, and the final slice focused on what market was out there that still had the potential to be disrupted. Despite the influence of alcohol, it was clear where the pair’s passion lies—design. For Goldberg, a serial entrepreneur in technology, it was product design. And for Shellhammer, a retail and home design expert, everyday fine design and tastes had become more than just a hobby. The two realized there was no one place where you could find handpicked, well-designed objects for your home, life, closet and more. And thus, Fabulis was reborn as Fab, the fast-growing, design-focused online retail platform that was just valued around $600 million, less than a year after launching. Four products are purchased every minute on Fab. And today, Fab is revealing another $15 million investment from VTB Capital and Phenomen Ventures. Part of what has made Fab successful is the talent at the top and compatibility of Shellhammer and Goldberg. As Shellhammer tells the story, the duo met each other on the dance floor of the Roxy, a New York nightclub, in 1999 at 2 a.m. They remained friends, and shortly after meeting, Goldberg moved to San Francisco, and Shellhammer joined him at his startup as an assistant. The job was short-lived (only three months), but the friendship lasted. “We were never best friends or talk-all-the-time friends, but we had a very unique friendship where we respected each other’s skills,” Shellhammer explains. A decade later, Goldberg approached Shellhammer with the idea of Fabulis. At that point, Goldberg had already founded Jobster and Socialmedian (which he sold to Xing in December 2008). He was ready for his next startup, and when he moved to Germany with Xing in 2008, he realized that there was no online travel reviews resource tailored for gay individuals who were living or traveling abroad. The idea for Fabulis was born, and the first person Goldberg thought of to help him build the “TripAdvisor for gay people,” was Shellhammer. Not only did Shellhammer have a great sense of design (he went to Parsons School of Design and worked at Design Within Reach and Blu Dot), but he had been an editor for gay and lesbian news blog, Queerty, where he would frequently write about similar content Goldberg envisioned for Fabulis. Although Shellhammer says the last place he wanted to work was in tech company (he finds them boring), he believed in Goldberg’s vision. “Gay people have a different set of needs and requirements in travel and gay-friendly places to visit. Jason was the tech guy and I was more a taste guy,” Shelhammer says. But one thing is clear when talking to both of them: Jason implicitly trusts Bradford when it comes to design, and Bradford implicitly trusts Jason when it comes to all things business and technology. Fabulis launched in 2010 as a social network for gay men, with an emphasis on helping men discover what’s happened in their cities or locations. The startup had raised a little under $1 million from The Washington Post Company Mayfield Fund’s Allen Morgan, Xing founder Lars Hinrichs, and Burson-Marsteller’s Don Baer. In December 2010, Fab raised $1.75 million more from First Round Capital, The Washington Post Company, Baroda Ventures and Zelkova Ventures. But despite the user-focused design, and even early mobile technologies, Fabulis didn’t take off. Why? Gay people didn’t need a separate service from Facebook for meeting each other and discovering new things. “We built a beautiful product, but it was frustrating because no one was using it,” Goldberg says. Shellhammer was at a breaking point after a year of developing and operating Fabulis. “I didn’t see where I was adding value, and was starting to lose belief in what we were really doing.” But despite the devastating realization that Fabulis wasn’t taking off, both founders never fought, or considered parting ways. And interestingly, the one small feature of the network that did get attention (and helped energize Shellhammer through some of the tough times during Fabulis) was a weekly deals offer that he curated. These ranged from magazine subscriptions and clothing to food and furniture. Goldberg has a philosophy in product development — you can’t iterate your way into a business model. Fabulis kept iterating, and adding new features, and nothing was really working besides deals. At the beginning of 2011, Goldberg and Shellhammer were commiserating over alcoholic beverages about what to do next with the business. As the duo poured their sorrows into their drinks, they realized that the one part of the site that was actually doing well — the deals — could be combined with their love of design. During the fateful dinner, Goldberg’s a-ha moment was that he wanted to build a business around Shellhammer’s taste and passion for design. And he quickly realized that there was no one doing this, and that they had the opportunity to create the one place where you can find handpicked, well-designed objects that were hard to find. By February, Goldberg and Shellhammer decided to shut down Fabulis completely to focus on the new Fab. Goldberg had actually already bought the domain name Fab.com, so the name stuck. On February 28, 2011, Goldberg and Shellhammer called a board meeting and told all of the company’s investors that they would be shifting to an e-commerce, flash sales-like platform. Goldberg recalls being nervous about pitching the idea that there needed to be a design-focused e-commerce site in an Amazon world, but he felt strongly that Shellhammer’s relationships with the design community would help make Fab a brand that would be synonymous with design for years to come. Goldberg and Shellhammer offered to give each investor their money back but the duo happened to be very convincing, investors wanted in, and the board meeting lasted only 20 minutes. “The clincher was that I told them that I was going to invest $250,000 of my own money in the new business because I believed in it so much, and they could take their money back,” Goldberg said. Howard Morgan, a partner at First Round Capital and early investor in Fabulis and then Fab, believed in Goldberg and Shellhammer for a variety of reasons. Morgan adds that when Jason offered to give First Round’s money back after the pivot, he wanted to stay along for the ride. First, Goldberg has founded a number of companies, and in Morgan’s experience third companies tend to be very successful. “The third company is where entrepreneurs understand what went wrong in the first and second experiences, and they can really focus on the third, especially if they had some success in the previous ones,” he says. The duo also had tons of energy and First Round was impressed with what they had done on a shoestring budget when they raised the seed round for Fabulis. And another appeal to the pitch was that Goldberg was using metrics as a benchmark before launching — Goldberg wanted to attain at least 100,000 sign-ups before launching. On March 9, Fabulis officially shut down, and Goldberg set out to get his sign-ups. The startup put up a placeholder page with a sign-up for member emails. Within 30 days, 50,000 people signed up to receive daily emails about Fab sales. Between outreach in the tech, fashion and design communities, Fab has started to create a decent set of potential users. But Goldberg and Shellhammer, along with fellow co-founders Nishith Shah and Deepa Shah, were worriedly trying to develop the e-commerce platform quickly enough so that people wouldn’t lose interest. To keep people engaged in April and May, Fab would send email surveys every couple of weeks to signed up users about what categories they like, and as an incentive to participate, Fab offered the opportunity to win a product. Fab also created an online pinboard, which allows people to upload their design inspirations to an “inspiration wall.” Additionally, Fab began advertising on Facebook. Within two months, the membership grew to 175,000 users with zero sales. Fab officially launched on June 9, 2011, with four sales. Sales on the first day included posters with Milton Glaser’s infamous “I Heart NY” logo, and an energy-efficient light bulb. The sales, which were sourced fully through Shellhammer’s relationships, sold $65,000 worth of product, and the next day brought more revenue and so on. Within the first 20 days, Fab has sold $1 million worth of merchandise. “I gave everything I had inside of me to court the best stuff in the world for launch. I wanted the caliber of product to be sold on day one to be high,” said Shellhammer. When he envisioned what people would want to buy, he thought of himself and what items would get him fired up to actually make a purchase. What made Fab distinctive off the bat was that the startup didn’t pitch designers on Fab as a liquidation outlet or flash sales site. “Even though we launched as one, we evolved from the flash sales model,” he explains. “We never intended for Fab to be a place where we would be selling deeply discounted items, we were betting that the awesome design of the products would be the motivating factor for purchase, not the price point.” Once designers and manufacturers realized that Fab was designed to simply showcase and sell their hard to find and unique items, it wasn’t hard to convince sellers to offer products on the e-commerce platform. Her first sale was in July, and because of that sale, Barney’s NY called Murse to design a style of jewelry for its Holiday pop-up shop. Since July, Murse has done four individual sales for Fab, and because of the revenue increase, she’s been able to quit her other job and focus purely on her jewelry business. She adds that she loves using the site as a purchaser, as well. “We thought people would be excited, but we didn’t anticipate how much passion people have for well-designed products,” Goldberg says. The next step after launching the site to the public was to have the most beautiful, social site around, he adds, as well as to develop operations and customer service. While Fab had raised $1 million funding from investor/actor Ashton Kutcher, SV Angel, SoftTech VC and previous backers First Round Capital, Baroda Ventures and The Washington Post, to help mitigate growth costs, Fab closed another round of $8 million in July of 2011, led by Menlo Ventures with a number of institutional and angel investors participating, including First Round, Baroda Ventures, The Washington Post, Goldberg himself, SoftTech VC, SV Angel, Kutcher, Guy Oseary and A-Grade Investments, Zelkova Ventures, Kevin Rose, Jon Anderson, Don Baer, Josh Kushner, Dave Morgan, Ben Ling, and David Tisch. Goldberg says this funding allowed Fab to grow from 15 employees to 100 staffers. The company was able to hire Beth Ferreira, a former Etsy exec and retail consultant, as COO and David Lapter as CFO. By September, Fab was growing revenue by 40 percent from August. Goldberg realized he was onto something big when Fab hit 1 million members in November. “That’s the point where we started thinking of Fab as a brand, not a business,” says Goldberg. By November, Fab was on a run rate of $50 million for the year. The company projected to double this by 2012 to $100 million, but has exceeded this already. A year later, Fab has 8 million members and now expects to see $150 million in sales in 2012, nearly two years after launching with no revenue. Goldberg outlined a multi-pronged approach to the company’s growth and success over the past year. He explains that Amazon is ecommerce 1.0, and Fab had to start figuring how to build a multi-billion dollar brand of ecommerce in an Amazon world. So what does Fab do to differentiate itself? Sells products that aren’t found on Amazon. And customers are loyal—67 percent of daily purchases are from repeat buyers. Fab knows its audience. “Our user base are design enthusiasts who wished there was a MOMA store within a block from them, or love Design Within Reach but want more variety and lower price points,” says Goldberg. Adopters have an age range between 25-45, and most are between 25-35, with 70 percent of the audience female. Second, Goldberg and Shellhammer have had a steadfast focus on building a long-term brand vs. just making money. The site could have expanded to other types of products (and made even more revenue), but each item is carefully curated to fit in with Fab’s brand and culture. “We have a point of view that is built around Bradford’s design taste and sensibility; he is our Martha Stewart or our Marc Jacobs,” says Goldberg. 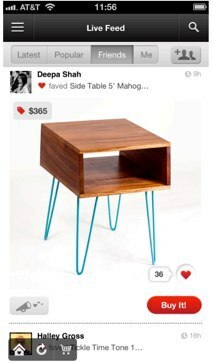 Another product area where Fab has made a huge bet is social commerce. Social sharing now drives 50 percent of membership sign-ups, and sharing is also a key component of driving sales within the site. By December, Fab had unveiled a Facebook news feed-like “live feed” that captured what users are purchasing, sharing, commenting on, etc. The idea was that as you see your friends buying certain items or sharing items, you’ll be more incentivized to purchase the same or similar items. Goldberg added that this has also been a big driver for sales over the past year. 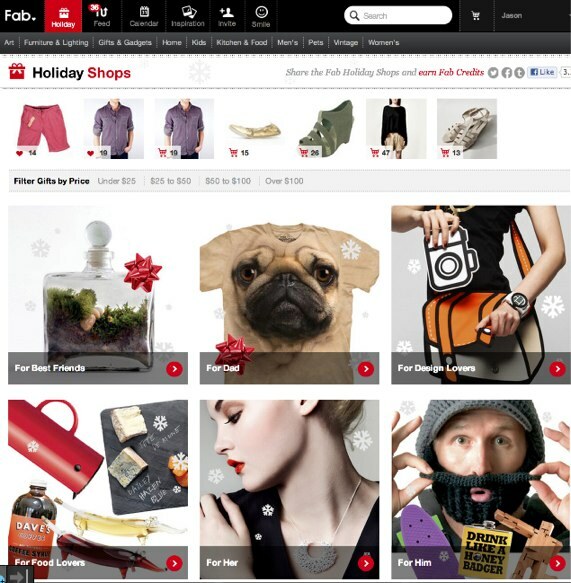 Today, Fab is debuting its holiday shopping experience. A new Social Strip provides a constantly updating feed of the most recently trending activity on Fab, showing what people are buying, favoriting, sharing on Facebook, Pinterest and Twitter. To date, Fab says people who visit the Fab Live Feed convert to purchasers twice as often. “We’re trying to create a web browsing experience that’s more like the iPad,” Goldberg says. Fab has also placed mobile as an early focus, with the launch of iOS and Android apps shortly after launch in June. Every few months since then, Fab has updated its apps with new features, including search, a new UI, browsing features and more. Purchase rates on mobile off the charts, says Goldberg, and Fab is seeing 7.5 percent conversion rates on the iPad, which is well above average for ecommerce. Now, Fab says that forty percent of revenue comes from mobile (a few weeks ago, this was at 30 percent). That’s $17 million last year, and $50 million this year. Goldberg adds that he’s building towards a day when mobile is more than 50 percent of purchases. Lastly, Fab made global a priority. “We want to be everywhere where people are buying,” explained Goldberg. In December 2011, Fab raised $40 million from Andreessen Horowitz and others to expand the e-commerce site to international markets. At the time, Fab was valued at $200 million. Jordan explains that one of Marc Andreessen’s beliefs is that version one of e-commerce was for nerds, and version two is e-commerce for everyone else. This version is much more about merchandising, curation, and personalization, and these are all key features of Fab that make the site distinct, says Jordan. Jordan adds that Andreessen looks for entrepreneurs who want to change the world, and there is no one in the portfolio that thinks bigger than Goldberg and Shellhammer. This cash was then partly used towards strategic acquisitions to expand globally. Via the acquisitions of Germany’s Cascanada, and UK’s Llustre, the company has built operations so that e-commerce can be extended to Europe and beyond. Currently, Fab is available in 26 countries worldwide, and Europe will be over 30 percent of sales this year. However, there are challenges to fast growth. What keeps Goldberg up at night? “Keeping Fab, Fab,” he says. But he isn’t laughing — Goldberg and Shellhammer truly wants to create a lifelong brand. “We don’t want to sacrifice long terms gains for short term decisions,” he explains. Morgan, and Jordan agree that Fab’s major challenge is coping with scale and growth. The company not only needs to consistently find new, interesting products to sell, but also source enough inventory of these products to meet demand. Another challenge for Goldberg and Shellhammer is managing and maintaining culture. “There’s not a pixel that gets on our apps that I haven’t looked at, but I know that is hard to do as we scale,” Goldberg says. And of course, they worry about how to stay five steps ahead and reinvent while others are stepping in to the design e-commerce world, as well. So what will Fab become? Goldberg and Shellhammer have a clear strategy for how Fab can become a multi-billion-dollar company. First, Fab will eventually evolve into a blend of third-party and private label, Fab-branded and created products. Already, Fab has been offering its own products like t-shirts, but the vision is to have a number of basic items with the Fab brand, including towels, sheets, linens, flatware and more. Goldberg says that these Fab-branded items could be at least 10 percent to 20 percent of sales next year. Shellhammer says that Fab will be thoughtful about which categories the company should expand to with its own products. He feels that luggage, bedding and bath, and kitchen are all areas where Fab can create their own basics, but also sell the inventory from other designers. He adds that Fab is looking at areas where there isn’t as much inventory from designers. Of course, Fab will continue to invest in mobile, social and product discovery across all channels, verticals and countries. In July, Fab raised $105 million in Series C funding led by Atomico to help pursue these goals. Andreessen Horowitz, Menlo Ventures, First Round Capital, David Bohnett’s Baroda Ventures, ru-Net Technology Partners (RTP), Pinnacle Ventures, Docomo Capital, Mayfield Fund, and Troy Carter all participated in the round. The valuation in the round reportedly valued Fab at $600 million. And today, Fab is announcing a $15 million extension of its Series C round from Russian investors, VTB Capital and Phenomen Ventures. When Fab first closed its $105 million round in July, the intent was to raise around $120, but the company closed it with first $100 million. Goldberg is bullish on having international investors on board as the company expands into new markets. These investors, he explains, can help with logistical things like payments processing, sourcing and more. In another two weeks, Fab will close an additional investment (as part of the C round) from investors in another part of the world. He adds that these investments are done at the same valuation as the earlier Series C. The final close will take place by November 15. This money is also being used to invest in Fab’s own warehouse in New Jersey and to build another warehouse on the West Coast. Goldberg explains that the company is shifting towards a model of holding its own inventory so that purchasers can receive Fab products quickly within one to four days. The company previously had a drop-ship model where, when someone bought on Fab, Fab then bought the item from the supplier, and the supplier sent the item to the purchaser. Obviously this is a time-consuming process. Eventually, Fab moved to a third-party logistics provider to manage things, but to scale in a meaningful way, Fab needs to move logistics in house, says Goldberg. Currently 70 percent of products are shipped from Fab’s warehouse, but eventually all products will be managed and shipped in this way. And the new funding will be used to further Fab’s international expansion. The company wants Europe to be the size of the U.S. next year, and is looking at South America and Asia as new markets. Shellhammer would also love to have a brick and mortar presence, and possibly reinvent the art market. There’s no doubt that Fab is a compelling acquisition target. Goldberg declined to name names but did say that two large public companies offered to buy Fab, and while these offers were “flattering,” Shellhammer and Goldberg have no interest in selling. “Jason and I have never said the word exit to one another. We made the decision that we were going to build a big company as opposed to a quick win,” says Shellhammer. There’s no doubt that the future is bright for Fab. And what makes Fab so special is the irrational love that members and designers have for the site. It’s a kind of loyalty and appreciation that is rare, especially in a competitive market filled with other large players like Gilt, One Kings Lane and others. Goldberg and Shellhammer are some of the most passionate and honest entrepreneurs I have ever come across. I believe this honesty and trueness to their ethos will build Fab into the life-lasting brand that the duo wants to introduce across the globe. And if not, you’ll find them back at the bar drawing out their next big idea on a cocktail napkin.